Been in a slump lately. I spent a year and a half training in Fort Sam Houston to become a BioMedical Equipment Technician in order to avoid being assigned back into a Marine unit as a Corpsman and I end up getting sent to one anyways. On top of that, my year and a half of training is going to waste here. I sure can't wait for Texas to secede so I can desert and enlist in the Texas Naval Militia! (Mostly) Kidding aside, I've been messing around in CAD software and I recreated parts of a Browning 1919 and an AR15. My idea is to create an unholy union between the two. Basically it's a heavy-metal receiver shell that you can attach an AR15 upper to and it uses an AR FCG, but it handles like a Browning 1919, complete with spade grips, and can be mounted onto an M2/M3 tripod or a standard vehicle mount. There wouldn't be any real purpose for this, but I'd like to put a FM-9 9mm belt-fed upper on it, or a Fightlite Industries MCR. Basically the fun of owning a Browning 1919 but with cheap ammo. 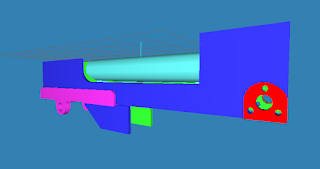 A flat-based AR receiver in progress. Browning 1919-like receiver with an AR15 upper. The extension below the bottom plate is a protective housing for the AR15 fire control group. I could have just cut the finger off and avoided that unsightly extension, HOWEVER, I wanted to be able to use off-the-shelf FCG units such as the Fostech Echo Trigger without having to modify it. It's raining outside and I made this completely unrelated video. It's probably in poor taste, but then again, so is protesting outside a building which has nothing to do with your cause.